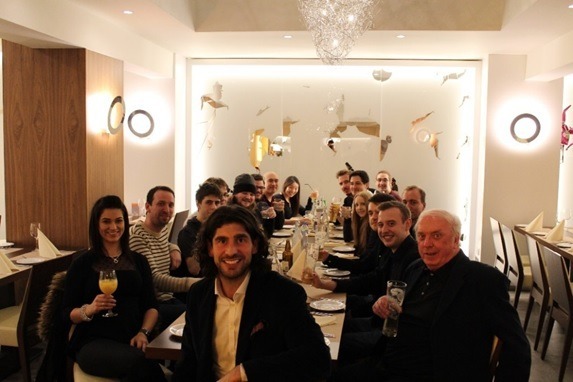 The Soap Media team in celebratory mood, with founders Adam (second on the left) and Markerle (centre). We’re the award-winning digital agency celebrating 10 years at the forefront of online business building! The family business was founded in 2005 by brothers Adam and Markerle Davis and we’ve since worked with clients such as the AA, American Golf, Blackpool Pleasure Beach, and Booths Supermarkets. We help businesses secure outstanding return on investment by streamlining website user journeys through conversation rate optimisation. With a combination of cutting edge web design and development merged alongside expert digital marketing, we’ve seen hundreds of businesses benefit from its bespoke approach. Whether it’s forward thinking online lead generation or cutting edge web design and development, we’ve been at the forefront of digital for a decade and we’re proud of our achievements. From humble beginnings working out of a Portakabin, the blend of expertise and ingenuity saw, in its first year, the business work with Pontins and American Golf. Search giant Google took note and certified the agency in 2006, paving the way for a big project with Slazenger on the Cricket World Cup. Over the next five years, we saw major expansion. The agency settled into new headquarters in Preston and Manchester city centres, spurring on the acquisition of fresh talent from the North West. The agency quickly gathered a team with a diverse skillset, such as digital marketers skilled in SEO and advanced PPC management campaigns, and web designers and developers capable of advancing the agency’s growing list of clients through exceptional work. Throughout 2015 we worked with clients such as Runshaw College, mda, Lancashire County Council, and The AA on an ongoing basis, providing marketing and website optimisation which continues to push these clients towards record breaking revenue. We’ve also supported the charity Think Ahead, designing its website, achieving Google Grants Pro, and delivering £40,000 per month in free advertising. In addition, the agency supported the children’s charity Brainwave at the Manchester Duck Race. We’ll continue to evolve its performance based marketing strategies in the years ahead, helping clients find the momentum they need to reach their full potential. And after 10 years in online business building, the agency has capped off a successful year with a shortlisting in three categories at the Northern Digital Awards, including Small Digital Agency of the Year. We were also hand-selected by Google for inclusion in its Google Elevator programme, which pinpointed the top 30 agencies in the UK which could be taken to new heights with a little assistance from the search giant’s expertise. We’ll benefit, our clients will benefit, and the result is we’ve got some seriously big plans for the future.